The Parking Prankster has been following this thread on moneysavingexpert. A summary of the thread is as follows. A motorist rented a car from Hertz. Hertz are the registered keeper. The motorist is also the 'keeper', according to the POFA 2012 definitions. The car was parked behind the keepers house overnight. 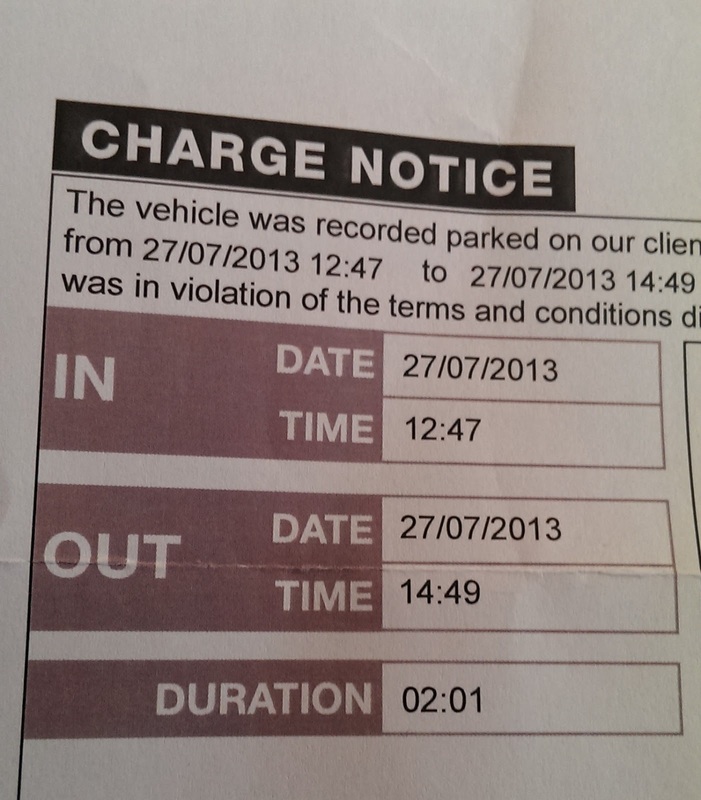 A parking charge notice was stuck on the windscreen of a vehicle on 21 June. The vehicle keeper claimed that when the vehicle was parked there was no signage, and that the signage was introduced later. He claims to have spoken to the ticketing attendant who told him that the signage was present, but was on the floor, and has now been restored to its proper place. There is no photographic evidence to back this up. The keeper then made a short appeal to ANPR denying all liability, but without supplying further reasons. ANPR turned down the appeal on 6 July and issued a POPLA code. The keeper claims that this was hidden in the letter and not obvious. The Prankster has not seen a copy of the appeal rejection so do not know if this is true. However, he has seen similar letters from ANPR in the past. On 8/8 ANPR send a parking charge notice to Hertz, who paid it without challenge and are now claiming money back from the motorist plus £42 admin charge. 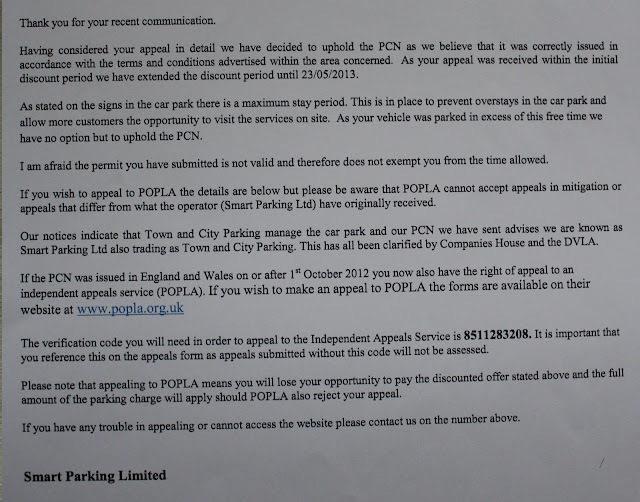 As the parking charge has now been paid, the motorist is in danger of POPLA cancelling the appeal. 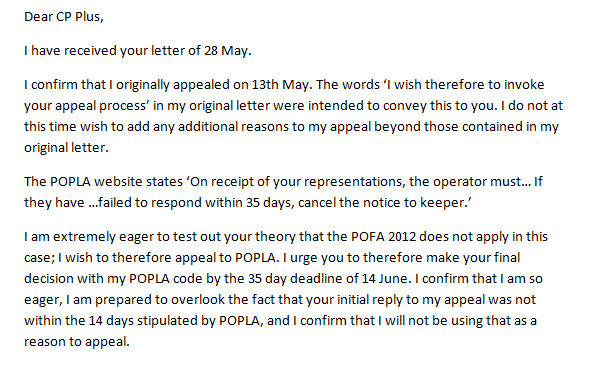 POPLA have recently had a secret policy change and have started to cancel all appeals where the charge has been paid. Allowing this situation to continue therefore threatens the motorists ability to use POPLA because the parking company can simply go behind their backs to the hire company, who will pay up and add their own charges. The Prankster considers the following breaches may have occurred and therefore should be investigated. 1) The POPLA code was hidden in the rejection letter and the instructions were not clear. This can easily be cleared up by the BPA Ltd on sight of the actual letter. This is a potential breach of the DVLA's KADOE Suspension Principles document, published on 31 Jan 2013, punishable by unlimited suspension until the situation is remedied. 22.6 When you receive a challenge about the issue of a parking charge, you must stop work on processing the charge immediately. 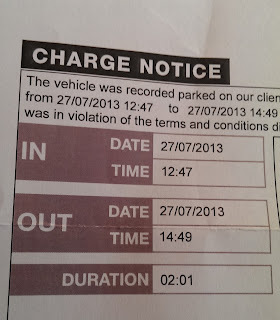 22.20 If POPLA rejects the appeal you may continue to recover the parking charge. 3) The DVLA details were requested when the keeper details were already known. The Prankster considers this is not in the spirit of the DVLA's KADOE Suspension Principles document, again punishable by an unlimited suspension until the situation is remedied. Although the driver had made themselves known to the operator, the keeper has. The Prankster recommends that the DVLA clarify their stance in this situation. The Prankster asked ANPR for their view of the case, to make sure they were not being misrepresented. Here is Trev's reply, edited only for confidentiality. We knew nothing about this case until the 1st of this month when we received an invoice for cases to be heard. On the invoice we noted case number [popla ref] and according to our records this case did not exist. We of course made contact and enlightened them to the error of their ways. In the mean time we had already made a justifiable application to the DVLA. Mr [motorist] implies that he is perhaps the registered keeper but possibly not the driver. On the 24/06/2013 Mr. [motorist] wrote: 'in regards to the invoice received with reference number P1345BH dated 21/06/2013 on my vehicle reg [reg]. I deny all liability to your company, If you reject this challenge then I require within 35 days a POPLA verification code' Nowhere does it indicate that he was the driver. By his tone we have understandably presumed that we have ticketed a vehicle that is not driven by the registered keeper. We therefore felt at liberty to pursue the registered keeper who will then inform us of the driver at the time of the incident. We still do not know who the driver was. But as suspected we now know that Mr. [motorist] is NOT the registered keeper. We of course replied with a POPLA verification code ([popla ref]) and an application form template. The actions taken by Hertz is of their concern but as perceived Mr. [motorist] is not, was not the registered keeper of the vehicle. Should Mr [motorist] case prove to be successful we will gladly reimburse Hertz. Mr [motorist] who lives at [his house] was ticketed on the [college grounds] whose car park is located to the rear of his property. The Prankster considers that there is reasonable cause for confusion here and that a sensible outcome would be something along the lines of the following. 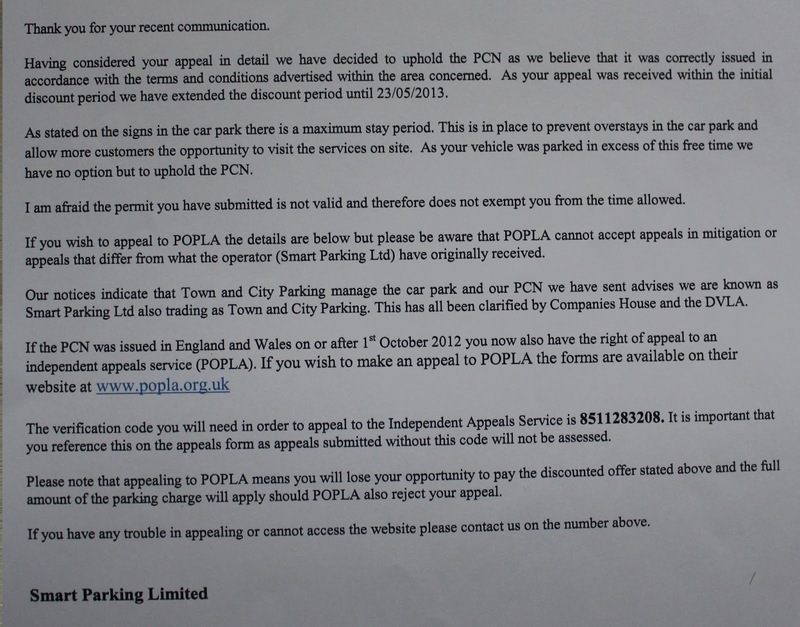 ANPR change their rejection letter, if necessary, to clearly give the POPLA code and explain how to appeal to POPLA. They remove all offers to do this on the motorist's behalf. The Prankster has seen emails suggesting that Peter Beasley from the BPA Ltd is currently investigating this incident, so awaits the outcome of investigations. The AOS board minutes which were formerly here have been removed. The Prankster has no idea why. The Prankster blogged about these minutes here. [Update 30/8/13] The Prankster has been informed that WDTK were asked to remove the content because personal information remained. A new redacted version should be provided 'in due course'. Previously, The Parking Prankster won an appeal at POPLA against CP Plus when their Notice to Keeper was delivered outside the required timescales. CP Plus withdrew the charge rather than supply any evidence. When they sent him a new notice, also outside the required timescales, The Prankster therefore appealed using the same grounds he had won at POPLA before. CP Plus refused to accept this as a valid appeal, ignored his letter and started debt collection procedures. Astonished, The Prankster complained to the British Parking Association Limited. "The operator has advised that they never accepted your correspondence as an appeal." The Prankster considers that letting an operator decide what is or is not an appeal is not the right of the operator, especially when they have lost on that appeal point in the past. Presumably operators will now be flocking to follow in CP Plus's footsteps, and decide that all manner of grounds are no longer valid ones for appeal. The Prankster guesses that landowner permission and justification of pre-estimate of loss will be the first ones to go. Highview Parking spurred into immediate action - for real! For once, Highview Parking came good on their threat to be spurred into immediate action, as this Parking Charge notice shows. Surely Highview are aware that the British Parking Association Limited code of practice states that grace periods should be allowed for leaving a car park? 13.4 You should allow the driver a reasonable period to leave the private car park after the parking contract has ended, before you take enforcement action. The Prankster believes that at least 5 minutes is an acceptable grace period for most situations, rising to larger amounts when congestion prevents drivers leaving the car park. The Pranksters awaits the result of the appeal! Today POPLA ruled that a registered keeper's cat should be found not guilty of all parking charges. The appellant asserted his cat had driven to Staples. The Staples parking attendant, despite searching the store diligently, could not find the driver. Presumably this was because they did not look under the shelves. Maybe the cat was playing with the mice in the computer department. Possibly even, the cat was in the warehouse having a quick kip, as cats do. In any case the operator could not come with a pre-estimate of loss justification. No doubt CPS Midlands will think twice before purr-suing any feline drivers in the future. The Prankster notes this case was filed on 31 May and it took 88 days to complete. The nominal target is 35 days, and the POPLA KPI set by the BPA is 44 days. Thus POPLA are still well behind schedule and do not yet seem to be eating into the backlog. The Prankster's last two decisions took 83 and 91 days, and he has outstanding cases which have been waiting for 126, 103 and 78 days. The Impact Assessment for introducing keeper liability for parking (compiled in 2011) considers the financial impact of changing the law. A reduction in the number of cases taken to court, due to the introduction of an independent appeals service, which in turn would benefit the Criminal Justice System. 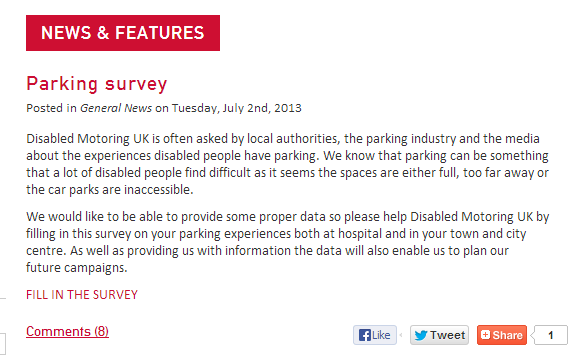 To determine this, the government consulted with none other than the British Parking Association Limited. The Department for Transport has consulted informally with the British Parking Association (BPA). The BPA is the largest professional association in Europe representing organisations in the parking and traffic management industry. These organisations are many and varied, and operate in a variety of different ways. They include manufacturers, car park operators, local authorities, health authorities, airports, railway companies, shopping centres and theme parks. The BPA currently has over 700 corporate members (of which 148 are members of an ATA and so authorised to obtain vehicle keeper information from DVLA), split about equally between the public and private sectors. The BPA has asked for the same parking enforcement regime as that operated by local authorities on public roads - in particular, the introduction of keeper liability for parking charges on private land. Both these scenarios are expensive and time consuming. Businesses will benefit from better compliance and an increased proportion of tickets paid when parking transgressions do take place, instead of incurring costs on debt recovery. The BPA has said that of the 1.8 million parking charges currently issued each year around 2-5% (36,000 to 90,000) of cases are taken to civil court per year. Court costs are not expected to increase and have not been forecast because keeper liability will not be brought into force until an independent appeals service is operating throughout the country. As it so happens, these figures are a complete fiction invented by the BPA Ltd. This report on TV licence dodging shows that there were 1.46 million court cases in 2012, with 180,000 of them being TV licence cases. A figure of 90,000 parking cases a year would make more than 1 in 20 court cases parking related. Obviously no quality assurance whatsoever was done by any of the people involved in this report, because it would have been immediately obvious that this figure was ludicrously inaccurate had anyone done the most cursory checks. One person (Bargepole) who did check these figures found the truth was rather different. The number of cases filed at county court in 2011 was 845, which is approximately 0.5% of the figure guessed by the BPA Ltd. Of these, only 49 proceeded to a contested hearing. In 2012 the figures dropped to 600 cases filed and 34 contested hearings. We can safely say therefore that the figures produced by the BPA Ltd were complete fabrication with no basis in fact, and that no-one bothered to check them in the slightest. This will no doubt eventually be an embarrassment for the minister that signed the report off. What of the predictions that court cases will fall? So far, we have not yet had a full years worth of figures. However, the ones that are available are pretty damning. Here are the FoI requests that The Prankster is aware of. The figures show we have already had 4806 cases filed in the first 9 months of Keeper Liability, with ParkingEye contributing around 2378-2438 of these (there is some discrepancy between the different FoI requests, probably cause by variations in the name used to file), and Civil Enforcement Limited 1101 cases. An initial projection for a full years worth of figures gives 4806 * 12 / 9 = 6408. However, this fails to take account of the way the number of claims are escalating. Here are the month by month claims by ParkingEye so far. If ParkingEye continue to escalate at this rate, we can expect another 4,000 cases filed by them alone. The Prankster thinks 11,500 cases filed is a sensible estimate, and this figure is likely to increase next year. Thus, far from saving the courts time and money, we will have almost 20 times more cases filed in 2013 than 2012. The Prankster has no idea how much a court case costs the Ministry of Justice. However, ParkingEye pay £15 to file each case. Some cases are no doubt settle by scared motorists without court involvement, but others are not. The Prankster thinks that the amount of management time needed by the court will soon swallow up the £15. If the case proceeds to a hearing, ParkingEye pay another £50 for 1-3 hours of a Judge's time, and in those cases the taxpayer is certainly losing out. On balance then, The Prankster thinks that the MoJ is worse off as a result of the new schedule 4 POFA 2012 law. The two companies filing the most cases, ParkingEye (PE) and Civil Enforcement Ltd (CEL) seem to have different strategies. CEL do not appear to want to go to court, and appear to be using the threat of a hearing to scare motorists into paying. This obviously works in sufficient number of cases. When the motorist fights back and uses a robust defence, CEL drops the case like a hot potato. Where the motorist does not appear to know what they are doing, CEL will chance the occasional court punt. ParkingEye on the other hand, will go to court whatever the cost. Where they feel their case is weak they will offer between £50 and £100 to settle, but if this not paid they will still proceed to a hearing. 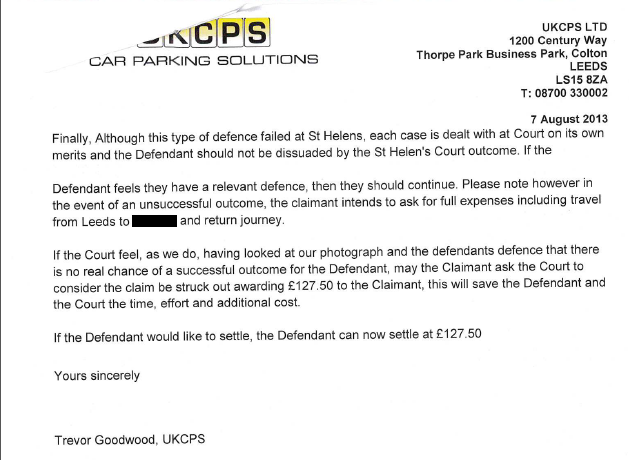 Even in cases where the landowner orders PE to cancel the parking ticket, PE still want £50 to drop the case. This hardball attitude is undoubtedly very successful for them, and persuades many motorist to pay. When the case does go to court, the outcome can be a bit of a lottery depending on the judge's leanings and the ability of the motorist to articulate the case. However, PE always lose out financially whatever the outcome because they pay their lawyers from LPC Law £200-£300 which they cannot normally reclaim. Their strategy must be therefore to eventually accumulate enough court wins so that they can frighten more motorists into paying. This assumption has been proved completely wrong for many reasons. The Prankster assumes that no serious thought was given to this assumption and it was waved through without wasting any brain cells. POPLA are upholding 50% of appeals. Furthermore, POPLA cost the parking company a non-reclaimable £27 (with a true cost of over £100), and a large amount of internal effort to put together the evidence pack. Therefore POPLA is not an appealing proposition for the parking company. They can pay £15 (which is reclaimable) and go to court instead, with a much better chance of frightening the motorist into paying without spending any serious effort. The number of motorists projected by the BPA Ltd to use POPLA is minuscule (23k per annum). The actual number using POPLA is even less (estimated around 15k this year). As this is less than 1% of tickets issued, and 30% go unpaid, POPLA was never going to be an influence on court case figures. Parking companies actively try and avoid POPLA. Despite warnings from the BPA Ltd and POPLA this practice still continues. The Prankster concludes that no thought whatsoever was given to the assumption that court cases would fall as a result of the new law, and that this statement was once again, total poppycock. So what will happen now? The policy will be reviewed in 2016. The Prankster considers that this will be an interesting review. Warning. Some of the statistics The Prankster used in writing this report came from the BPA Ltd. They may therefore be as much use as a chocolate teapot. 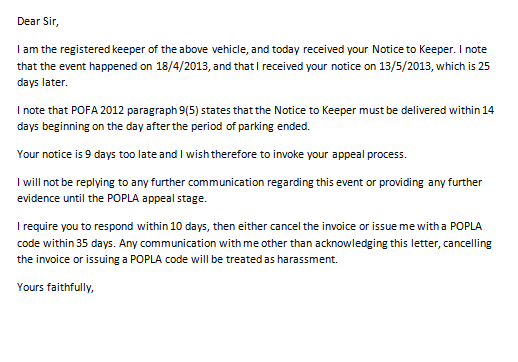 The Prankster has received a copy of a letter from UKPC who are intent on pursuing a dead motorist for parking charges. We write with reference to your recent correspondence in relation to the above Parking Charge. As per our previous letter, we can confirm that we have made our final decision regarding your appeal. Please refer back to this letter and the three options that are available to you. We appreciate that this is not the outcome you will have hoped for. Please forward on a copy of the drivers death certificate, otherwise, unless you have any additional information that you have not already brought to our attention, this decision is final. Although further correspondence will be noted and filed, please do not expect any response from us except where you have provided new evidence to substantiate your case. I was very sorry to read of the death of Mr X. If you could send us a copy of the death certificate, or order for service or in fact any document which notes the passing of the deceased we would be delighted to cancel the parking charge. Given that this is a stressful time we will take no further action to pursue our claim until 90 days has elapsed. The Prankster agrees. Sadly, it seems that UKPC are more concerned with pursuing the loot at any cost, even though they are in breach of the British Parking Association Limited Code of Practice for pursuing a driver with a blue badge. 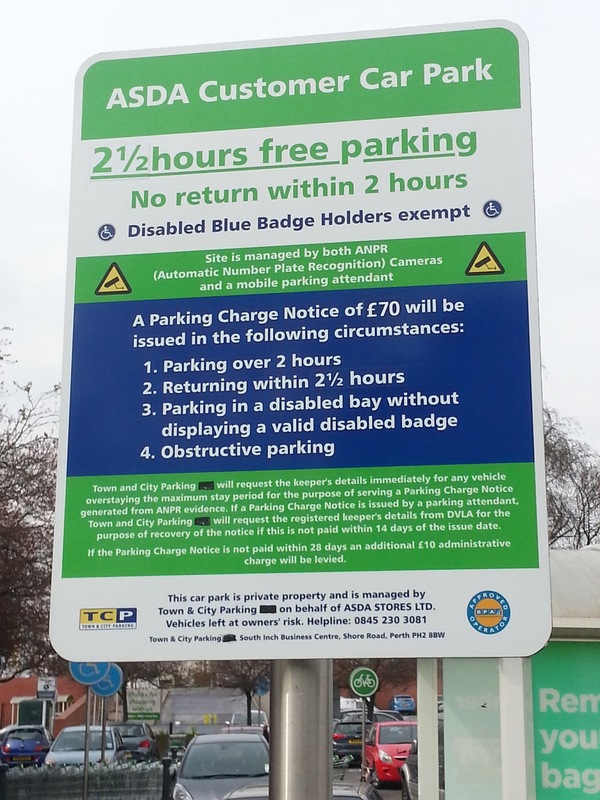 16.5 If your landowner provides a concession that allows parking for disabled people, if a vehicle displays a valid Blue Badge you must not issue it with parking charge notices. Long thread on pepipoo, so get your coffee ready first. This is only the motorist's costs. NCP presumably forked out a similar amount to their own legal team. The motorist was originally only asking for £1500. Richard Reeve goes Runabout. Can POPLA still call itself independent? Richard Reeve is Tribunal Manager at POPLA. In the recently published April minutes of the British Parking Association Limited AOS Board, it transpires he has been making visits to Parking Companies, and is more than willing to continue the practice. "Richard Reeve has held meetings with a number of operators, which have proved useful, and he is happy to hold further meetings with others if they are requested"
These meetings are in addition to the training seminars Richard Reeve has been conducting for the Operators (blogged about here). In a hasty spin last month, Nick Lester stated that the training sessions were above board because they were arranged by the British Parking Association Limited. These other meetings appear to be arranged by Richard Reeve off his own bat, without BPA Ltd involvement. The Prankster eagerly awaits Nick Lester's spin on these meetings. The Prankster takes this as another sign that POPLA is not independent. It cannot be right that POPLA employees hold private meetings with members of the parking industry unless they are equally prepared to offer meetings with private motorists too. If any private motorist successfully arranges a meeting with Richard Reeve, please let The Prankster know so he can publish a retraction. Richard Reeve can be contacted for appointment bookings by the Parking Companies on 0207 520 7202. In a flagrant display of disdain for the motorist, Nick Lester (he of many hats) produced statistics for the parking operators analysing the categories of POPLA appeals. The top category of appeal was signage, followed by fluttering tickets, which he noted were usually refused. The Prankster notes that these statistics are never made available to motorists, putting them at a significant disadvantage. Indeed, in his annual report the lead adjudicator made clear his refusal to make results available to the public, even though PATAS does. The Prankster considers that if POPLA wish to appear independent, they should make all statistics equally available to all parties. The Prankster wonders why Nick Lester is spending his time compiling figures on behalf of the parking operators while he is supposed to be independent. The Prankster wonders why POPLA is making these statistics available to Nick Lester. Michael Greenslade is the lead adjudicator of POPLA. He is supposed to be independent, but offers a backdoor service to parking operators where appeal decisions can be reviewed offline. "if there appears to be a repeated error in judgment on a matter of principle, this should be taken offline for Michael Greenslade to consider/address." The Prankster considers this is an abuse of access to POPLA. If Michael Greenslade is willing to correct repeated errors on behalf of parking operators there should also be a mechanism where motorist groups can have the same access and service levels. This should be published and transparent. The Prankster also found the following interesting snippets in the minutes. As well as ParkingEye losing vast sums of money at court hearings, Excel have announced they want to join the party and have found some lawyers willing to turn up for cash. If any other parking companies wish to join in, Excel can put them in touch. Parking Companies typically lose around £200-£300 if the case goes to hearing and they use solicitors, even if they win the case. 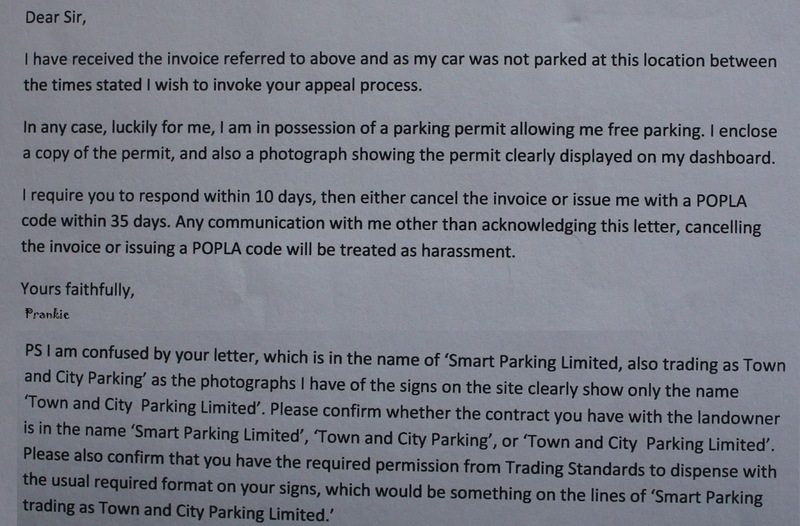 Parking Companies don't like the BPA Ltd, and have compiled an anonymous we-hate-you document. The BPA Ltd disagree, but the crunch will come when the second ATA, Independent Parking Committee, goes live. The Prankster is no longer taking bets that ParkingEye will be the biggest company to leave the BPA Ltd. The DVLA cannot service parking operators requests fast enough, even though it makes £millions from them. Presumably it has not yet occurred to the DVLA to hire some more staff. There are half as many POPLA appeals as predicted, but it is costing more than expected. The operators wanted to know if the BPA Ltd would be paying POPLA the increased sum. The BPA replied they were doing their best to drive costs down. The Prankster notes that this meeting was in April, appeal numbers have been rising since then, and many more assessors have been hired. He predicts that cost will rise. The DVLA suspension principles were circulated. These are also available online, and make interesting reading. Sadly, the DVLA do not appear to be following their own principles. The BPA Ltd stated that "POPLA is an ADR service which can be used to offset the County Court system, and can be offered or withdrawn at any time". Presumably they will withdraw it when it starts to cost them too much money to operate. The POPLA delay was stated to be 5 days, which is amusing considering The Prankster's oldest appeal is now 120 days, and their own figures show they had 794 appeals more than 9 days late at the time of the meeting (28/4/2013). Some clampers have gone out of business. Now that the football season has started, Smart Parking will no doubt be pleased to go into a two-nil lead against the Prankster at POPLA. Here is the match report on their latest successful POPLA case. The Prankster double dipped an ASDA site, visiting once at lunchtime, once in the late evening and duly received a Parking Charge Notice a few days later. Initially the Prankster appealed on the grounds he was not parked for the times alleged. He also thought he might have have a valid permit. In passing, he also mentioned that he thought the signage was not in the right company name. Someone seemed to have scribbled on the 'Ltd' in black pen, but it was still clearly visible. 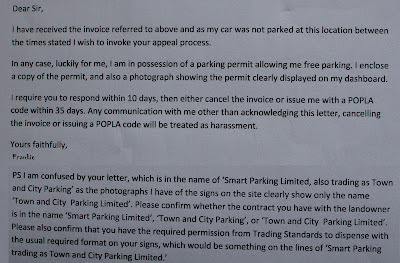 Smart Parking replied, denying the appeal, and also forbidding The Prankster from appealing to POPLA using any other grounds than in his appeal as reported in the Prankster's very first blog. This was naughty of Smart Parking, and after a few letters to the DVLA and BPA this was sorted out as reported here. The Prankster therefore decided to appeal to POPLA. Initially, despite Smart Parking's fears, he decided to use the same reasons as his original appeal. After a while though, The Prankster considered it would be more helpful to other motorists if he appealed using different reasons than ones he has previously succeeded with. POPLA is very secretive about the reasons motorists can use to appeal. Although Nick Lester regularly reviews the reasons for POPLA appeals succeeding and reports back to the operators advising them how best to modify their cases to succeed, there is no such service provided by Nick Lester to the motorist. Similarly, although Richard Reeve of POPLA regularly meets with Parking Operators (this is in addition to his training seminars reported here) and is willing to meet them at any time, he does not appear willing to meet with motorists. When The Prankster phoned him up to arrange one, he declined. The Prankster therefore reviewed the photographs of the signage he took during his visit. Here is one of the signs. The Prankster read the wording on the signs. 2 1/2 hours free parking. Amazing at is seems, The Prankster totally missed the fact that the sign says that parking is free for 2 1/2 hours, but that a charge notice will be issued after only 2 hours. Still, it is an easy mistake to make, and no doubt one that Smart Parking will be taking their signwriters to task for at some date in the future. The Prankster instead considered that the sign implied that the parking charge was for a service; namely parking for more than 2 hours (or perhaps more than 2 1/2 hours!). Nowhere is it forbidden to stay for more than 2 hours; it is just free up until that point, and charged afterwards. The charge is therefore not for breach of contract. It is a charge for parking services. This is similar to the text quoted by the POPLA lead adjudicator in his secret May newsletter to parking companies. "The amount sought as the parking charge may be a term of the contract, rather than a sum for breach of it. If this is the case then reference to the signage may be sufficient. 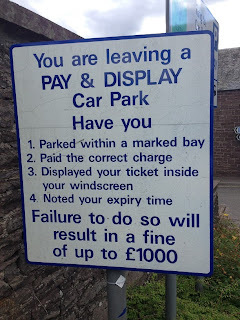 Some signs make it very clear, for example: ‘The tariff for overstaying or parking outside the bay markings is £100’ "
The Prankster was therefore surprised when he reread his Parking Charge Notice to find this was for a breach of contract. The notice clearly states there has been a 'contravention' and the charge is for a 'breach of advertised terms'. The Prankster therefore decided to modify his appeal to say that the signs declared that the parking charge was a contractual charge but the PCN was for breach of contract. He was therefore surprised when his appeal was turned down. Here are the assessors comments. The operator issued a parking charge notice to a vehicle with registration mark CST U£27. The operator recorded that the vehicle was at Asda Store, Bedminster for longer than the permitted time of 2 ½ hours. The operator’s case is that the appellant’s vehicle was at the site for longer than the permitted time. The operator submits that this is a breach of the terms and conditions listed on the signage at the site and therefore the parking charge notice was correctly issued. The appellant does not dispute the operator’s case. The appellant’s case is that “Smart Parking therefore refer to the charge both as a term of the contract and a breach of the contract. 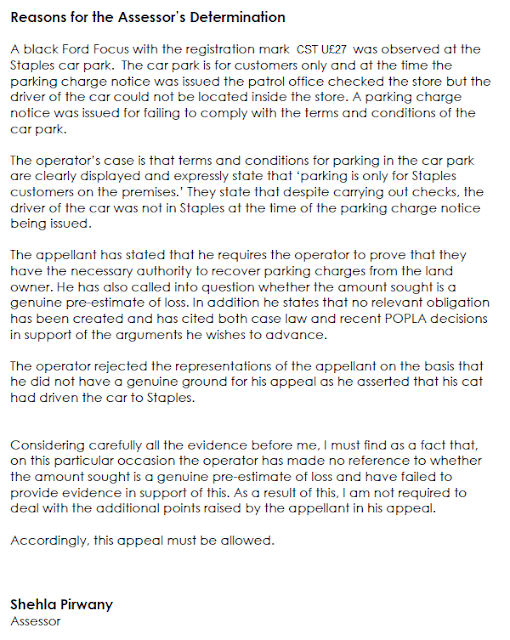 As Smart Parking do not refer to the charge in a consistent way and do not appear themselves to know what the charge is for the appellant asks that the appeal be upheld”. Considering all the evidence before me, I find that the appellant’s case does not have a valid ground in order for me to allow this appeal. I also find that by the appellant being at the site for longer than permitted, they breached the terms and conditions of the site, which they accepted on parking their vehicle there. The Prankster is bemused by this decision and does not feel the assessor has properly considered the ramifications of her decision. Never mind though; Smart Parking may have a two nil lead at the moment, and be over the moon at their success, but The Prankster is not as sick as a parrot; it is only half-time, and there is still all to play for. The Prankster has no hesitation in mixing his metaphors, switching seamlessly between football and cricket, and has called for his first DRS (decision review system) of the innings. He has appealed to the Lead Adjudication for the following reasons. This is clearly not the case, as no terms and conditions have been breached. The PCN is therefore not valid. As the appellant has brought this to the assessors notice he requests that this be revisited and fully assessed. 2) A parking charge which is a contractual charge is fundamentally different from a parking charge for breach of contract. A contractual charge is equivalent to a normal parking charge, such as a pay and display ticket. It is a charge for a service, and can be invoiced and VAT applied. It can be reclaimed as a business expense in appropriate circumstances and accounted for against the profits of the business. The true charge will be 20% less if the business can reclaim VAT. A charge for breach of contact has no VAT. It may not necessarily be reclaimable as a business expense or accounted for against business profits. By attempting to change the charge from a contractual charge to a breach of contract, this changes the cost by at least 20%, and potentially 100% to the appellant, who can otherwise charge this as a business expense. 3) Furthermore, contractual charges and breach of contract charges are treated differently in the British Parking Association code of conduct than breach of contract charges. The appellant can argue that a breach of contract charge is not a true pre-estimate of loss, and ask the operator for a breakdown. He cannot do this for a contractual charge. 4) The appellant therefore believes that he has the right to know what the charge is for, that the operator cannot have signage that asks for a contractual charge and then send a PCN that asks for damages for a breach of contract. As this has been brought to the attention of the operator, and also to the assessor, the appellant believes these points have neither been addressed by the operator or fully and completely considered by the assessor. The appellant asks therefore that the appeal should be revisited and upheld. The Prankster will keep you updated. 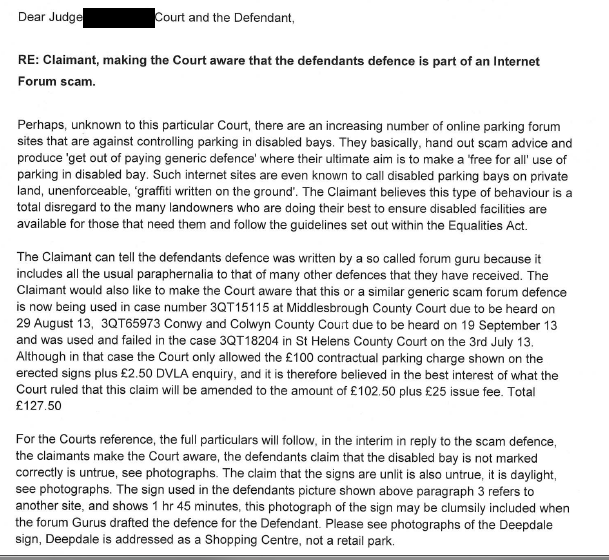 The Parking Prankster received a copy of a letter which UKCPS has written to a judge accusing the defendant of participating in an internet forum scam. The Prankster considers that Trev Goodwood must have been on something when he wrote that letter. The Prankster has seen no online parking forums where members are against controlling parking in disabled bays, let alone an increasing number of them. Two forums The Prankster is aware of, Pepipoo and moneysavingexpert, sternly criticise posters who park in disabled bays, and caution them against the practice. The Prankster googled the phrase 'graffiti written on the ground' but could find no parking related search hits. The Prankster wonders why Trev Goodwood considers the defences to be a scam. The definition of a scan is 'to swindle by means of trick'. Nobody has been swindled as far as The Prankster can tell, and The Prankster has spotted no tricks that have been used. Perhaps the real reason Trev is annoyed is that he drops large numbers claims where a defence is filed and so this is costing him money. Perhaps he ought to ensure that his legal case is watertight before he considers filing. Do you have an amusing letter from Trev Goodwood? The Prankster would be interested in blogging about it? The Prankster has been made aware of recent sharp practices by ParkingEye's legal department. ParkingEye's bungling legal team were caught out when they tried to pull a fast one on an unsuspecting motorist. With the court hearing imminent ParkingEye made a half-hearted offer to settle to the motorist, 'accidentally' sending it to the wrong address so that the offer had expired before it arrived. The motorist had an extremely strong case - so strong that ParkingEye sent a letter to the court complaining that it was 16 pages in length (which is ironic considering the length of their 'reply to defences'). ParkingEye also complained that the motorist did not include a copy of the British Parking Association Limited's Code of Practice. This is extremely ironic as ParkingEye regularly refer to many documents in their court claims, including the BPA Ltd Code of Practice, and never include copies. Perhaps if ParkingEye cannot lay their hands on a copy this is why they regularly break the code of practice, especially in areas of mandatory entrance signage and failing to justify pre-estimate of loss at POPLA time and again. After considering the offer the motorist decided he would lose more money taking a day off work than he would get back in court (costs are limited in the small claims court) and so decided to accept. He paid online the same day, and phoned ParkingEye to confirm the payment had been accepted. Most people would now consider the case closed, but ParkingEye decided to try and sneak one over on the motorist. They didn't cancel the case and prepared to turn up for the hearing, no doubt to try and get judgement for the full amount. The motorist only found out when he phoned the court the day before the hearing was due, and was surprised to find it was still on. He phoned ParkingEye who told him they had decided to 'drop the cancellation'. Cue a lot of worried reorganisation by the motorist so he could actually turn up in court after all. Finally, just after 5pm, ParkingEye emailed to say they had decided not to pursue the case after all. No doubt now their trick had been discovered, they realised they would be in for a pasting if they actually turned up in court. Naturally the motorist was still skeptical. The next morning, after much to-ing and fro-ing on the phone between himself, ParkingEye and the court, the motorist finally got confirmation the hearing was cancelled one hour before it was due. The Prankster considers that ParkingEye would be on extremely shaky legal ground if they carried on to a hearing after offering and accepting a settlement. 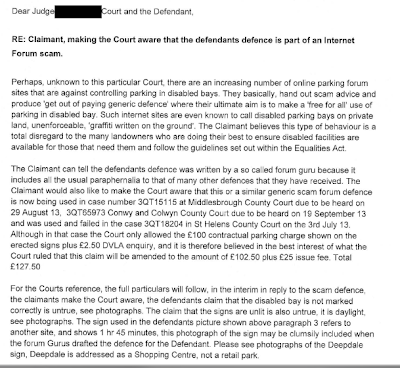 They may well get a default judgement for a larger amount than the settlement if the defendant did not show, and ParkingEye did not inform the judge of the settlement. However, The Prankster considers the court would be extremely cross when the full facts came out later; however, it would be time consuming for the motorist to unravel. Meanwhile, the costs to ParkingEye for not cancelling will be significant. As ParkingEye did not cancel the court case more than 7 days before the hearing they will still have to pay the £50 hearing fee. No doubt the solicitor from LPC Law will not be happy with being cancelled on the evening of the hearing and will still want his £300. All in all this underhand tactic has proved costly to the chaotic ParkingEye legal department, easily wiping out the motorists settlement and leaving them with another big loss. 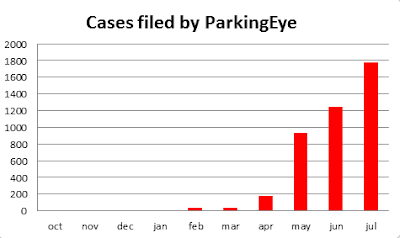 Recently, ParkingEye have lost large amounts of money each time they have gone to court. Are you a victim of ParkingEye's legal Tricks? The Prankster has heard many tales of ParkingEye 'losing' letters sent to them, 'forgetting' phone call conversations and the like. Keep detailed records; get a free proof of posting, record phone calls and take screenshots of web pages. Have you been a victim of ParkingEye's bungling legal department? Letter sent regarding someone else's case? Dodgy witness statements? Letters you sent never 'arrived'? Letters they send to the wrong address? Sharp practices? If you want The Prankster to blog anonymously about your case please get in touch via the usual email address. The Parking Prankster was pointed to a web page on the http://www.disabledmotoring.org web site. Although the page is gone now, there is still a copy in the google cache here. "Don't forget guys that charges on Private land are not the same as council tickets and if you get one you should appeal to popla and not be bullied in to paying the invoice. The may also be a case the ppc has breached the equality act..."
The Prankster thinks this is excellent advice, and that motorists should always appeal to POPLA, and not be bullied. 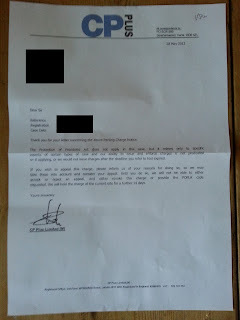 The Prankster notes that ParkingEye are one of the companies with the worst record in the industry for sending out bullying letters, sailing close to the wind, twisting facts, and writing aggressive inaccurate letters. The Prankster also notes that ParkingEye have no hesitation in ignoring the equality act, pursuing court action against people who have had medical incidents due to long term conditions, breastfeeding mothers and the like. ParkingEye also pursue cases where the landowner has required the parking charge to be cancelled, where motorists break down and where their pay machines fail. They are probably therefore one of the biggest bullies in the industry. ParkingEye's solicitor, coincidentally also called Rachel Ledson, files around 500 to 600 court cases a week against motorists. The Prankster would like to caution anyone who thinks the two Rachel Ledsons are the same. A quick google search turns up several RLs. It it most likely coincidence that the RL posting has legal knowledge, and also seems well acquainted with the parking industry to the extent she uses the abbreviation ppc, knows about POPLA and the equality act and the difference between private and council tickets. The Prankster reminds everyone it is also easy to set up a fake profile and post using any name. 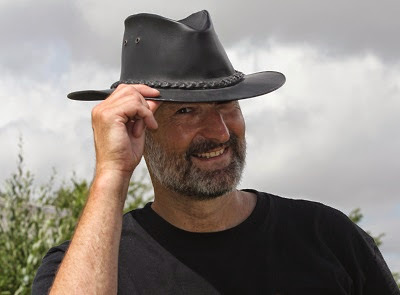 The Prankster would like to thank the person who sent him this link and also many other interesting links featuring people named Rachel Ledson. The Prankster has discovered that car park operators are brutal in Scotland. 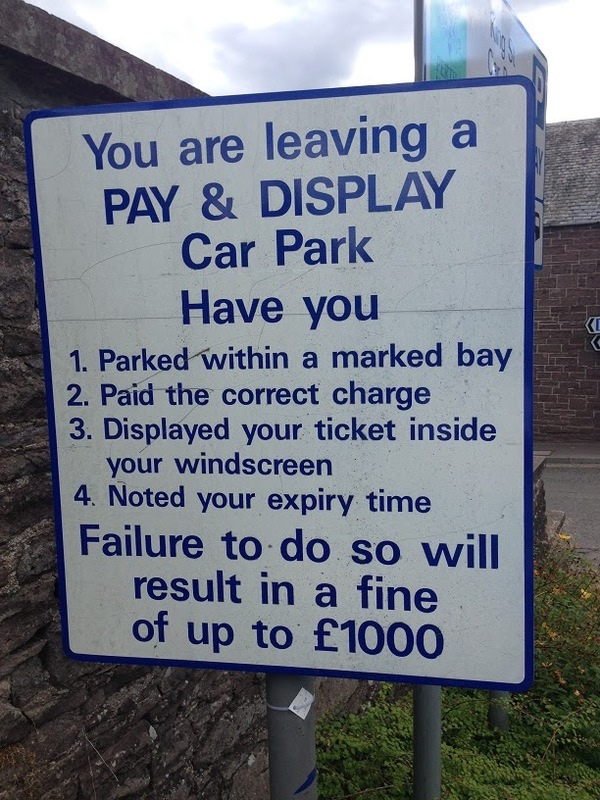 Don't forget to park correctly in Crieff or you may be 'fined' up to £1000. Is Outsourcing Parking a Poisoned Chalice for Supermarkets? Many supermarkets outsource their parking management to third parties. They are lured by the promises of the parking companies, who offer to do this for free. Of course, there is no such thing as a free lunch. The only way the parking companies can make money out of this is to charge penal amounts for minor transgressions and to brutally enforce these. Over the last few months The Prankster has been made aware of cases where the parking companies still attempt to enforce their charges in cases where the vehicle has broken down, the motorist had to wait for a diabetic passenger's blood sugar to level, the motorist had to breastfeed her newborn baby, the pay and display machines were out of order and many more. It is obviously in the parking companies interest to sail as close to the wind as possible (and beyond) to maximise their income. The downside of this predatory behaviour is a backlash against the supermarket, resulting in huge negative publicity and loss of income as shoppers move elsewhere. Somerfields found this to their cost some time ago. Their parking operator, ParkingEye, caused them endless customer relation problems so they terminated their contract. ParkingEye promptly sued them. Even though the judge found that ParkingEye were deceitful Somerfield still had to fork out £350,000 to ParkingEye to get rid of them. This was the amount the judge decreed ParkingEye would have gouged from Somerfield's customers over the lifetime of the contract. Aldi are currently going through the same problem with ParkingEye. Their Facebook page is still receiving messages from disgruntled shoppers regarding parking charges. Aldi either have to bite the bullet, get rid of ParkingEye, and face a large damages cost, or lose business and see their customers desert them for other supermarkets. However, there is a new smoking gun which may hit supermarkets even harder, as this exchange in Hansard records. Graham Jones (Hyndburn) (Lab): I congratulate the hon. Lady on securing the debate. There is a related issue, and I wonder whether it should be put out there as public knowledge. The Government need to come clean about whether we can tidy this matter up. These pieces of land were given a zero rateable value when the companies were given planning permission, or whatever permission it was, and now an income is being made from that land. The Government need to look closely at whether the Valuation Office Agency should try to revalue pieces of land where car parking charges are being applied, on the grounds that as there is now an income from it, the rateable value should be reviewed. I hope that the Government look at that, and I want to put that on the record. Most supermarket car parks are zero rated. However, it is clear that Parking Companies are making large profits out of these areas. There is no requirement to wait for government to sort this issue out. Any motorist who has received a parking charge can contact the Valuation Office Agency (VOA) with their concerns that their local council is being deprived of money to which they are legally entitled. The VOA will then investigate and if necessary assign a rateable value to the land. The council can then charge the supermarket a fair market rate for the car park, backdated to when the parking company stated to operate. This of course will be a disaster for the supermarket. They will not be able to charge this back to the parking company because the contact will not allow for it. The parking company will be laughing all the way to the bank as they trouser the money from motorists. The supermarket will be left to pick up the rate bill. The promised 'free parking management' has now become an expensive mistake, but there will be no way out of the contract without incurring penalties. Update: Mr Mustard points out that although the supermarkets will be hurt initially, the costs will be built into new contracts with parking companies. The Prankster agrees this will happen, but thinks that now the genii is out of the bottle it cannot be put back in. As questions have been raised in parliament it is inevitable that councils will eventually get round to investigating this, and as they can backdate rates The Prankster thinks this might as well happen sooner rather than later. The crunch time will be when Aldi or other supermarkets have to renew their contract with the parking company. They may well choose not to renew at all, and apply for the rates to be reviewed again. Passing the costs onto the parking company will open another can of legal worms. The Prankster thanks the motorist who sent him the Hansard link. The Parking Prankster's oldest POPLA appeal is now 100 days old. The Prankster eagerly raced downstairs this morning to see if his appeal had received a telegram from the queen, but she was apparently busy with other matters. Last week The Prankster had an appeal assessed which was only 83 days old (48 days late). Two more similar appeals, filed the day afterwards, are still waiting forlornly in the dank basements of POPLA Palace. Adjudication dates are currently therefore all over the place. The Prankster does not consider his appeals particularly difficult to judge, especially as in one of them he recently updated the appeal by filing a witness statement based on the witness statement provided by the Lead Adjudicator in his secret May newsletter. Surely this should be rubber-stamped straight through the appeal process? Meanwhile, The Prankster still has no reply six days after he emailed a complaint regarding his POPLA appeal which was rejected. This is strange considering that the parking companies get same-day turnaround on complaints. In a decision recorded here on Pepipoo, POPLA upheld the appeal because the operator provided no evidence that the landowner could operate on the land. This was strange because the operator did provide evidence; it was a self created format though, and not in the style secretly created by the Lead Adjudicator and sent out with his May newsletter. Perhaps this was why the assessor did not recognise it. The next day the motorist got a hasty note from POPLA saying the decision had been revisited. Presumably this was a result of a furious phone call from the operator. The Prankster wonders why the operators are allowed direct access to POPLA and to challenge results via this path. His own challenge to a POPLA result which did not consider all the evidence was sent 5 days ago and still has not had an acknowledgement, let alone be revisited. Luckily for POPLA and the motorist, the decision was not change following the revisit, because the operator had not justified the pre-estimate of loss. Still, this action by POPLA does show that motorists are perfectly within their rights to challenge the decision if POPLA has made a mistake in the process. The Prankster considers that this is further evidence that POPLA is not independent. Complaints about decision should follow the same paths and timescales for both parties. The Prankster also sees the irony in the situation where the decision can be revisited in one day while the original decision was 6 weeks late in arriving. POPLA timescales are all over the shop at the moment. The Prankster has one appeal coming up for 100 days, while another was adjudicated after 48 days. Two others, filed on the same day as the 48 day one, are still awaiting adjudication a week later. Perhaps The Prankster's cases go into a special holding pen, and ar only let out when all the staff are in full protective gear. 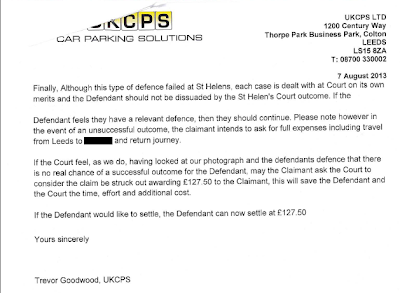 The Parking Prankster has now received a second letter from Debt Recovery Plus. After receiving the first letter, The Prankster wrote to Debt Recovery Plus denying the debt and also asking for clarification on several items. It seems The Terminator has been hauled off the case and been replaced by Ian Grantham, Collections Manager, who wrote this new long and detailed letter, answering many questions. It seems as if incompetence will always rise to the top because, as is common with the parking industry, none of these were questions which The Prankster had asked. Debt Recovery Plus should probably name themselves Doubt Recovery Plus. They appear to be unaware who the creditor was. In the first letter they stated explicitly that the creditor and the client was MOTO. When The Prankster asked them to confirm this, they forgot to answer. Elsewhere in the letter they now say they are acting on behalf of a 'client' who is authorised by the 'landowner', but they do not appear to be willing to say who either the 'client' or 'landowner' is. The Prankster is left none the wiser. In their first letter, Doubt Recovery Plus stated that MOTO had previously written to The Prankster. As this is not the case, The Prankster asked them to produce a copy of this letter. Doubt Recovery Plus did not comply, instead asking The Prankster to raise the matter with his postal service. They also state The Prankster had requested a copy of the PCN which is not the case. They refer to this PCN as 'automatically generated by a computer and sent via post and therefore while there is a record of the date/time such was dispatched, [they are] unable to provide a copy of the original.' As CP Plus have no problem in producing copies of PCNs for POPLA appeals, The Prankster considers this PCN must have been issued by some other company, and is still none the wiser who the 'client' is. Doubt Recovery Plus state that the site is subject to conditions stated on the signs and that 'the terms were breached because the vehicle was parked for longer than the time allowed on the site.' However, the signage, which the Prankster conveniently has a copy of, does not specify a maximum time for parking. The Prankster asked Doubt Recovery Plus for a breakdown of the £120 they were asking for. Doubt Recovery Plus completely forgot to provide this in their answer. They do however state that if the £120 is not paid the case will be 'passed to the legal department who will consider taking legal action.' The Prankster considers they will have a hard time in court if they do not want to divulge who their 'client' is and if they do not have a copy of the Parking Charge Notice. As Doubt Recovery Plus stated that they were considering taking court action The Prankster asked them whether they had the authority to do this. Doubt Recovery Plus dodged the question, instead saying their client was acting on behalf of the landowner. Presumably therefore Doubt Recovery Plus do not have the authority to take court action. Presumably also, neither do their client. Perhaps their legal department will be 'spurred into immediate action' on learning this. In their previous letter, Doubt Recovery Plus confirmed that they did not know the identity of the driver. The Prankster therefore asked whether they were pursuing him as keeper under POFA 2012 and they confirmed that they were not. The Prankster considers this could be a big stumbling block for them later on. Finally, they did send The Prankster two rather large black and white photographs of his car. Presumably this was so The Prankster could frame and hang them on his wall. 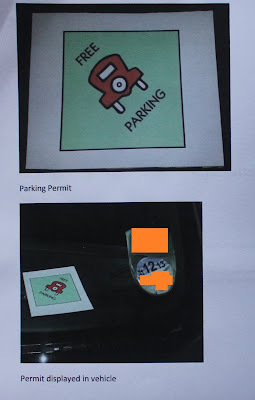 In any event, and not wishing to be seen as churlish, The Prankster send two different photographs of his car back to them, along with a letter which in true parking tradition completely fails to acknowledge any of their points raised. Hopefully this last letter from The Prankster will bring this round of parking poker to a close. Although DVLA like to charge £5 for telling you if a PPC accessed your data, they will give it you for free if there is a legitimate reason, such as suspected fraud. This email provided to the Prankster illustrates the point. Hi [DVLAPerson] , I believe that [NaughtyParking] may have committed an act of criminal fraud under the Fraud Act 2006 (Fraud by false representation (Section 2)) by falsifying the date of the letter to allow them to pursue a parking charge against me. In order that I can fully investigate the matter, and if necessary pass the information to the police, can you please confirm the date you supplied to [NaughtyParking] the keeper records of the vehicle in question. Given the circumstances I do not believe that your request for a fee is fair or relevant. I am not requesting personal details of a car/owner which you normally charge a fee but simply asking you confirm the date that your agency supplied a third party with my information as it is well within the balance of probability given the facts that they have falsified the date of the letter. I would also remind you that the whole situation has been created by DVLA passing on for commercial benefit my personal details to a company with questionable conduct (google [NaughtyParking] to see the level of negative reporting). I look forward to your co-operation. Thank you for your email regarding the release of information from the records held at DVLA. I can confirm that a request to obtain the keeper details of the vehicle was made by [NaughtyParking] on the 22nd May 2013. The response was issued the following working day. I hope this assists with your enquiries. [DVLAPerson], thank you for your response. Could you also confirm what method of communication was used to inform [NaughtyParking] of the keepers details ie by post. The relevant information was provided electronically via an SFTP network. I hope this information helps with your enquiries. 23. DVLA reported receiving an increasing amount of correspondence from the public around Schedule 4 of PoFA. Where ANPR is used the ticket needs to be provided to the motorist within 14 days and there are concerns that companies may be implying keeper liability outside of these timescales. DVLA had written to BPA asking them to advise their members that such disregard for this legislative requirement could lead to their suspension from receiving keeper information. The Prankster asks that motorists do not abuse the information provided above and only ask for their data for free when there is a genuine suspicion that the Parking Company are dodgy. A good benchmark would be to download the POPLA annual report and check the number of upheld appeals. If there are more than one or two then the company is obviously flying close to the wind. The email address to use is David.Dunford@dvla.gsi.gov.uk. The Prankster would like to thank [ConcernedMotorist] and Kevin Twats, his DVLA mole, for the information. The Parking Prankster has decided now might be the time to buy shares in parking companies. In a recent letter to him, the British Parking Association Limited effectively stated that parking companies are free to decide themselves what is or is not an appeal. Thus, they are also free to refuse to hand out POPLA codes and stop those rather inconvenient appeals. The Prankster has decided to choose whichever parking company has the most stringent and nonsensical appeals policy and then heavily invest in them. He can then sit back and watch the money roll in. If any parking companies wish to get in on The Prankster's investment round first before all the loot is gone, please email him at the usual address, explaining why your appeal process is most likely to generate large amounts of wahoola. The Prankster previously blogged about this here. Here is The Prankster's appeal letter. Here is the reply from CP Plus. Thank you for your letter concerning the above Parking Charge Notice. The Protection of Freedoms Act does not apply in this case, but it relates only to specific aspects of certain types of case and our ability to issue and enforce charges is not predicated on it applying or we would not issue charges after the deadline you refer to had expired. If you wish to appeal this charge, please inform us of your reasons for doing so, so we may take these into account and consider your appeal. Until you do so, we will not be able to accept or reject an appeal, and either revoke this charge or provide the POPLA code requested. We will hold the charge at the current rate for a further 14 days. The Prankster considered he had appealed, so replied. The Prankster is obviously disappointed that the BPA Ltd has not addressed any of his points satisfactorily. 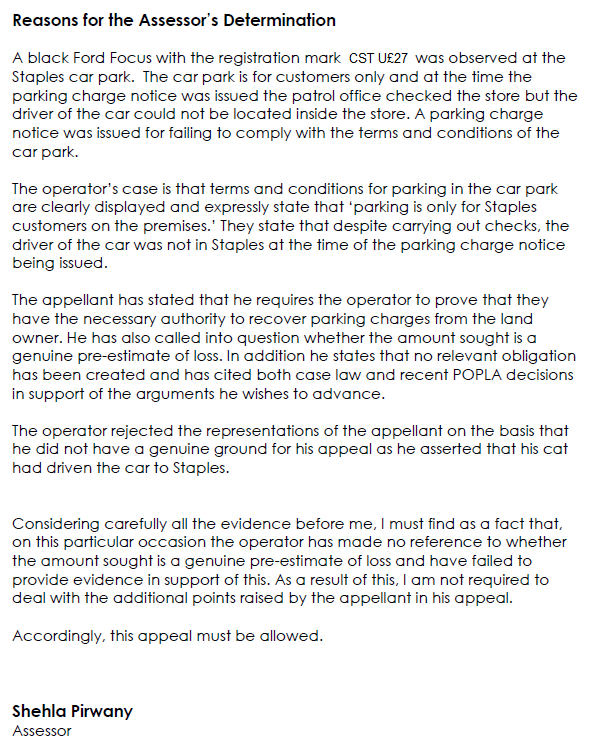 He considers that it is not the province of the parking company or the BPA Ltd to define what a valid appeal point is. This should be left to POPLA. If POPLA decide that an appeal is fanciful or nonsensical then they can withdraw the appeal and not charge the operator £27. However, he is wildly excited about this new investment opportunity and hopes that this blog post is not read to widely before he gets a chance to put his money into this new goldmine.